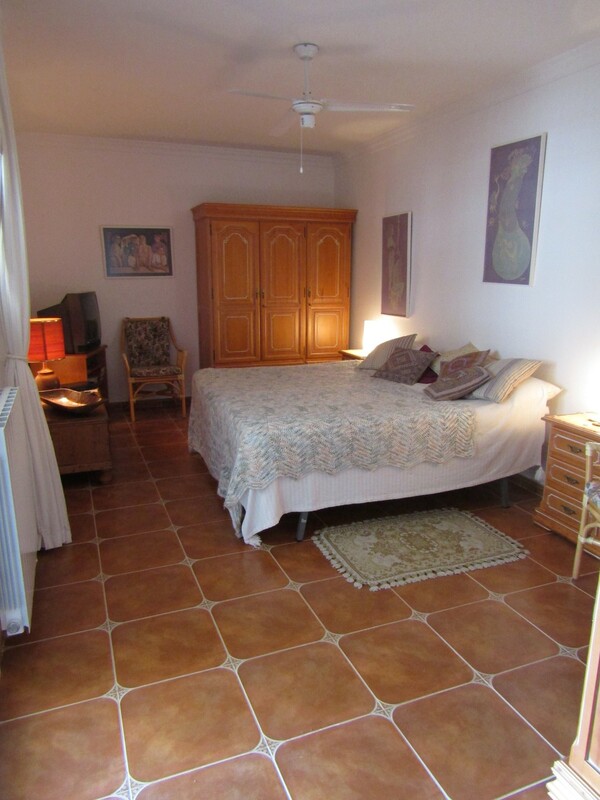 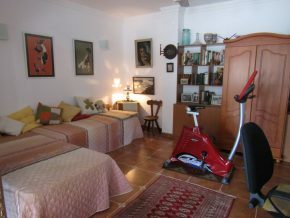 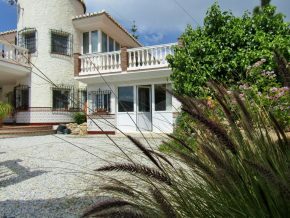 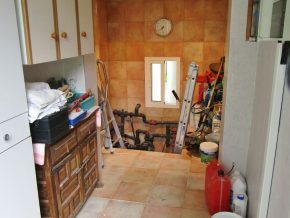 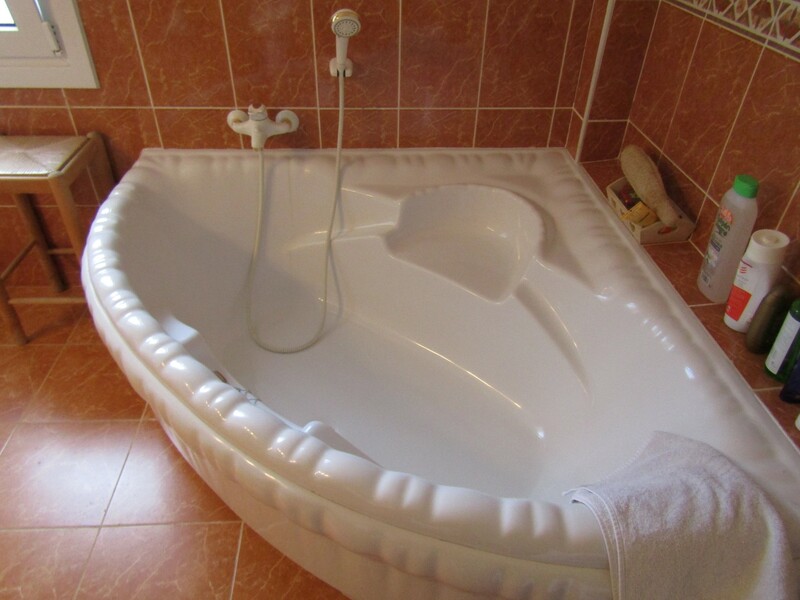 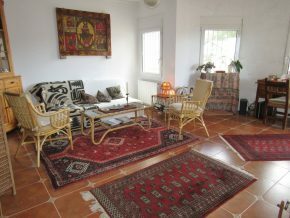 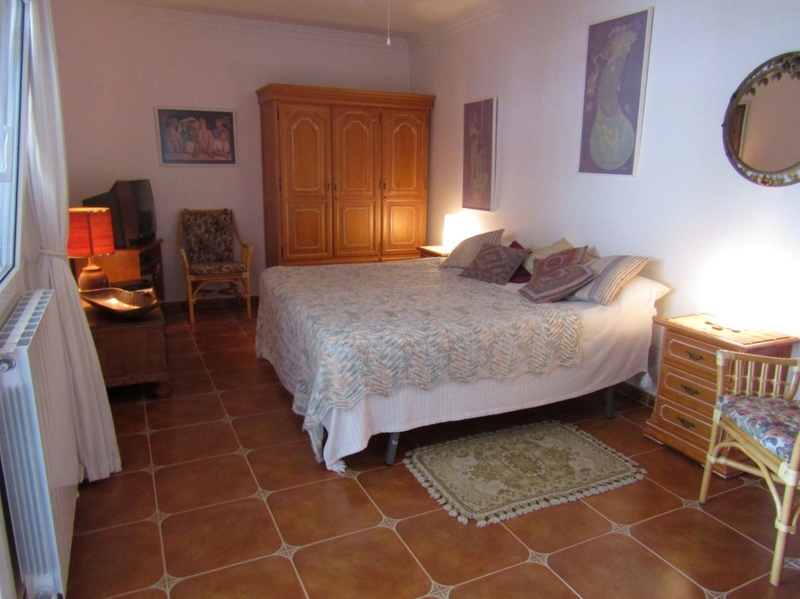 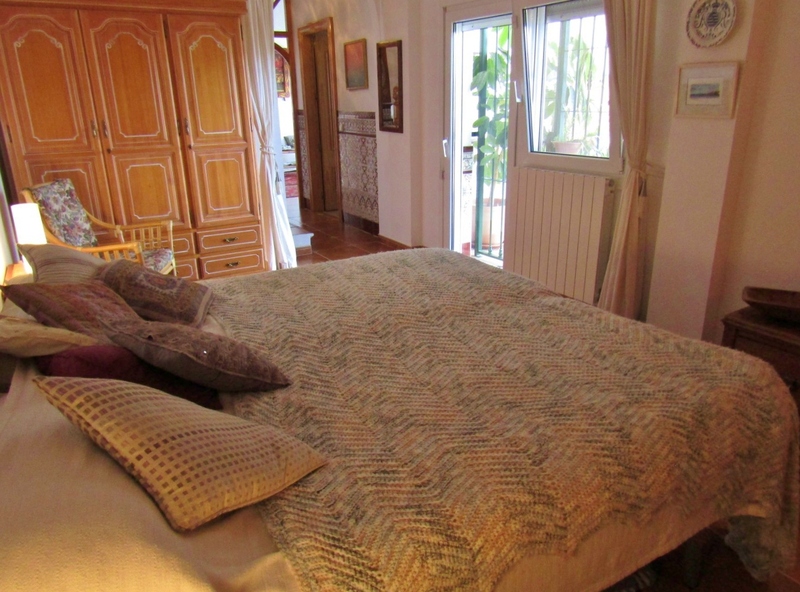 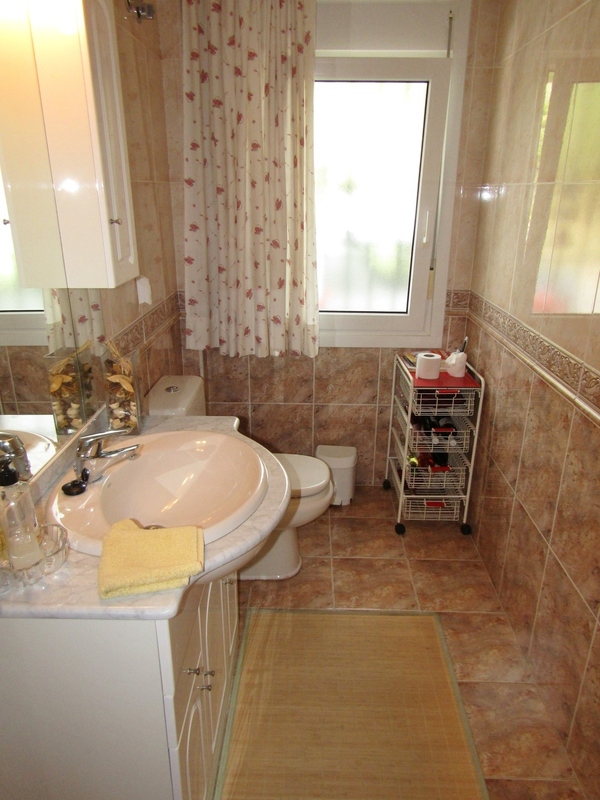 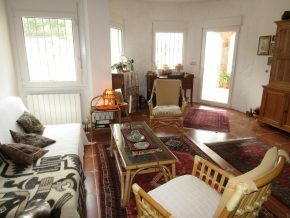 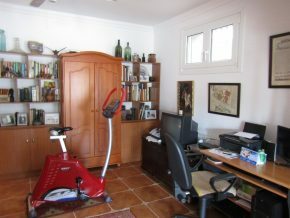 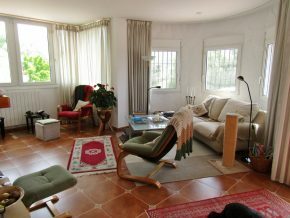 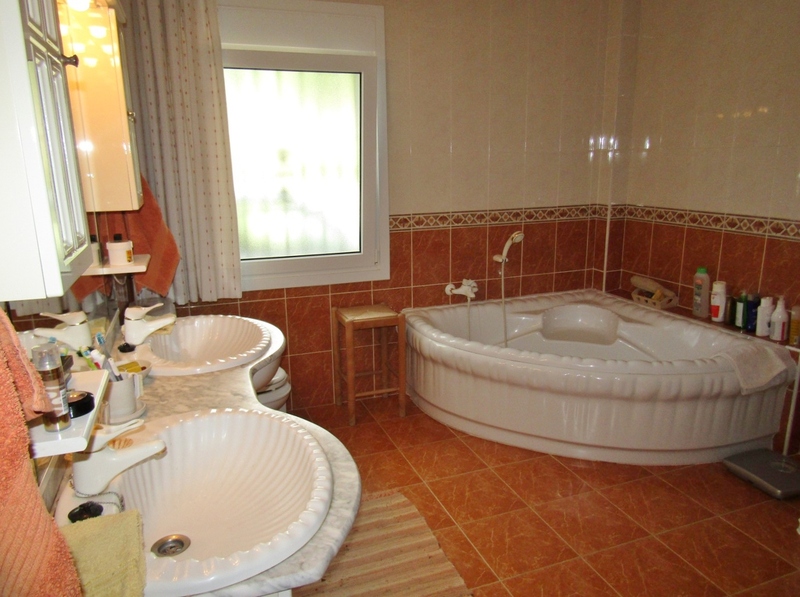 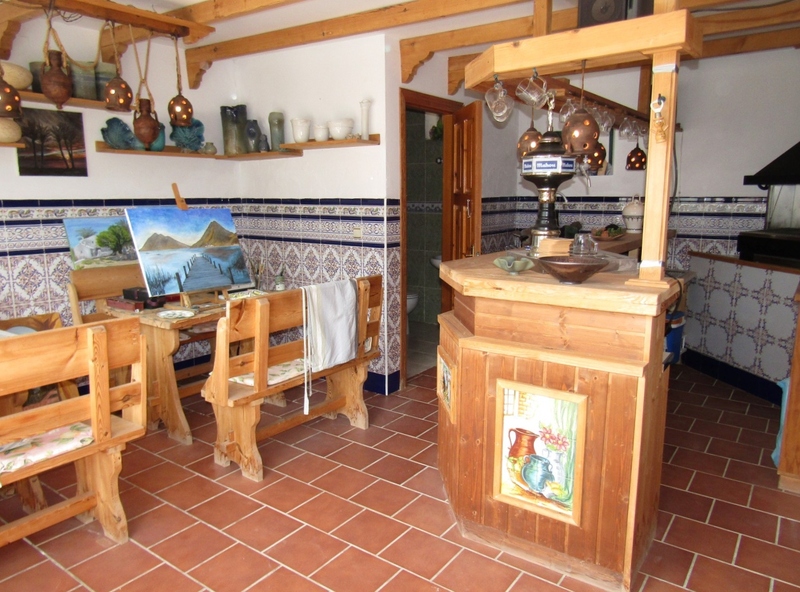 This is a sturdy, German built villa built around 20 years ago for maximum space and comfort. 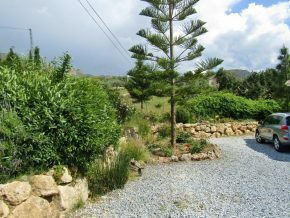 The property is set back off a quiet asphalted country lane with good access and 2.5 Kms from facilities, and in an area that is not too hilly. 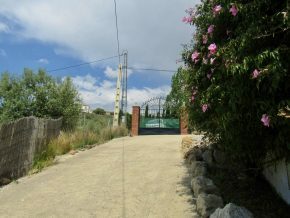 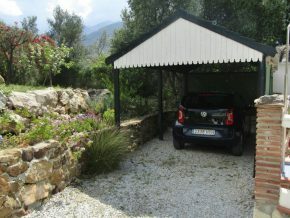 The gates lead into a gravel drive and parking area for several vehicles, plus a drive that runs down the side of the property and behind the house to a covered car port. 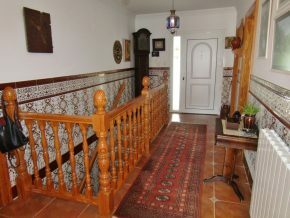 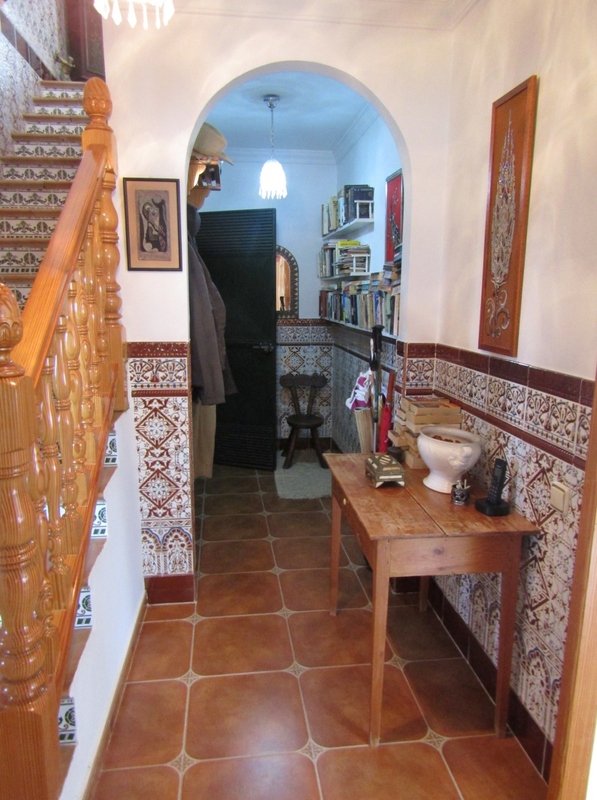 The front door leads into a spacious, traditionally tiled hallway, with stairs to the right and a wide passage to the left leading to the open plan living room at the far end. 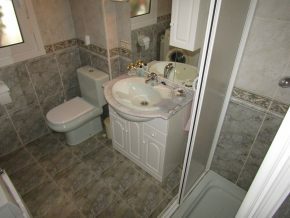 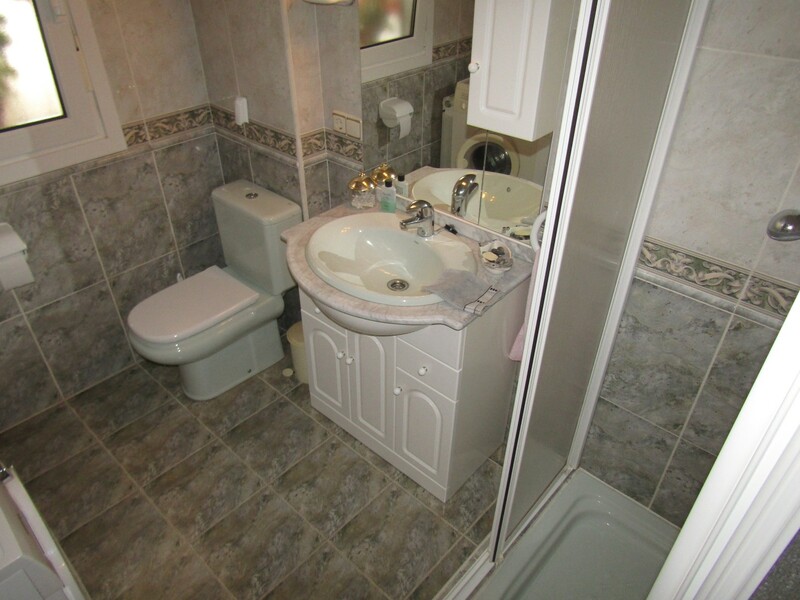 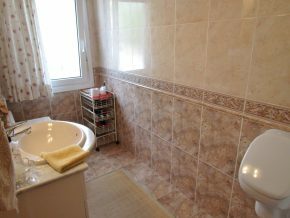 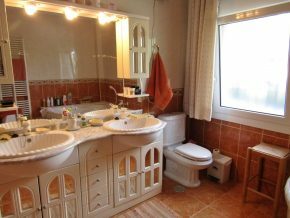 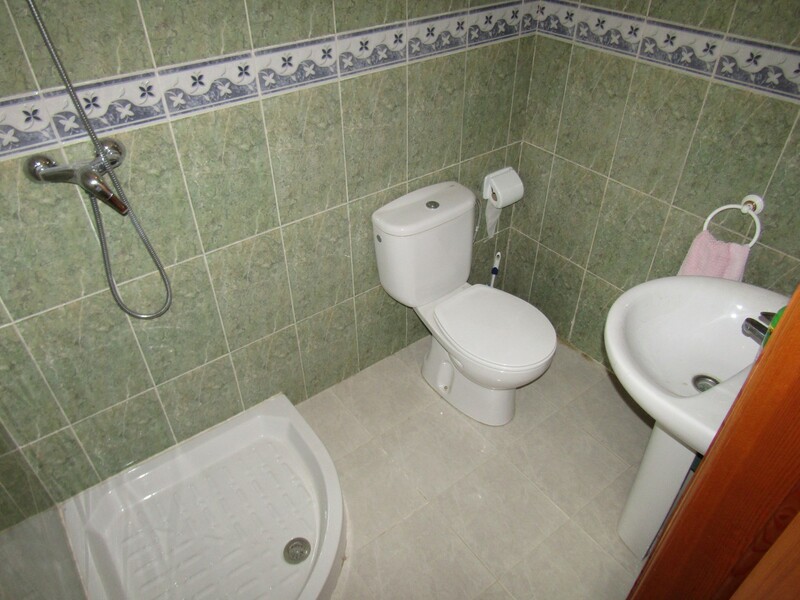 Upon entering, immediately to the left is a WC, with separate urinal (1.25 x 3.25m) and next to this is the master bedroom which is a very generous 5 x 3.5m and a very large en-suite bathroom (3.5 x 3.5m) with ornate corner bath, ‘his and hers’ wash basins and a separate 1m2 shower cublicle. 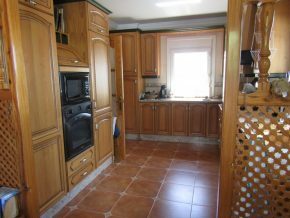 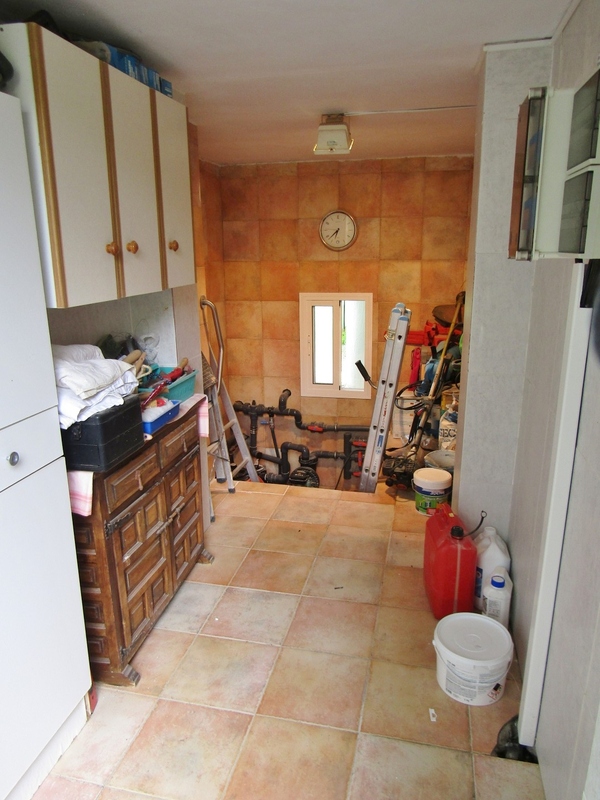 Back in the hall, beyond the stairwell, a door to the right leads into the fully fitted, quality kitchen/diner (5 x 3m) with kitchen table to the far end and bookshelves above. 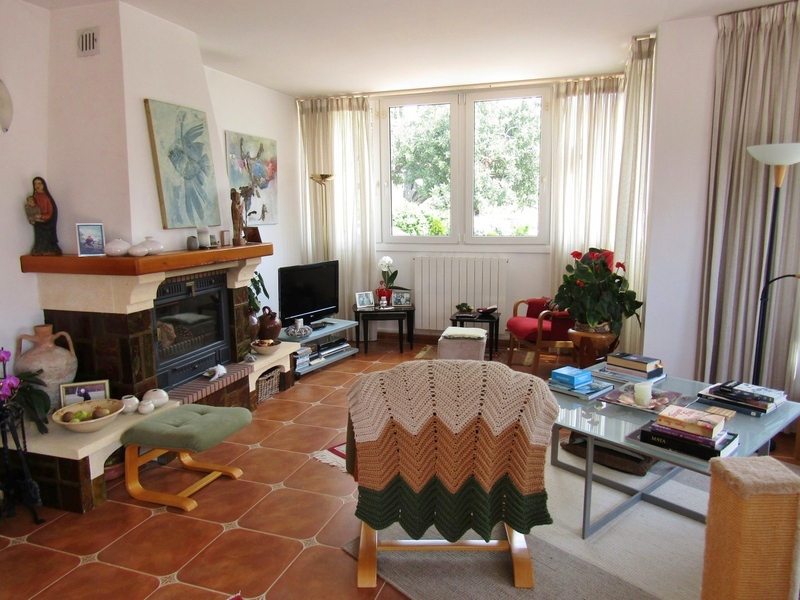 The living room area is 7 x 3m, plus a semi circular area, with plenty of windows letting in lots of light and delightful views out to the terrace and gardens. 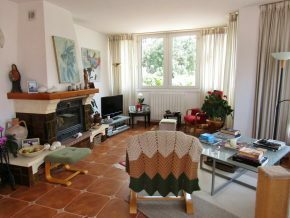 There is also a centrally featured woodburner fireplace for cosy Winter evenings. 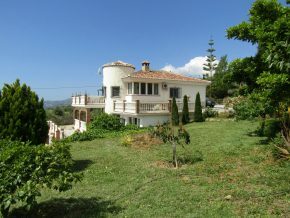 Whilst the front door, on the North side, is at ground level, as the plot slopes down the hill slightly, the living room, on the South side, has patio doors out to a terrace which looks down on the pool area one level below. 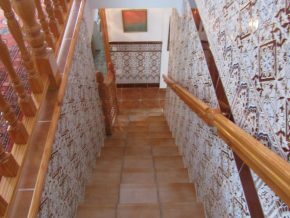 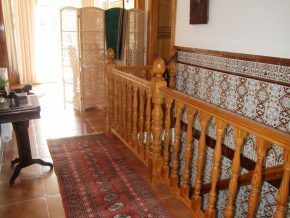 The stairs in the hallway lead down to the lower level and to the side of the stairwell, and under the stair area is a door to the utility and central heating room. 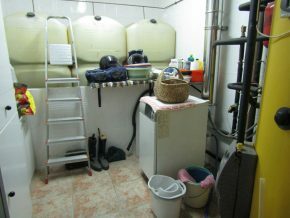 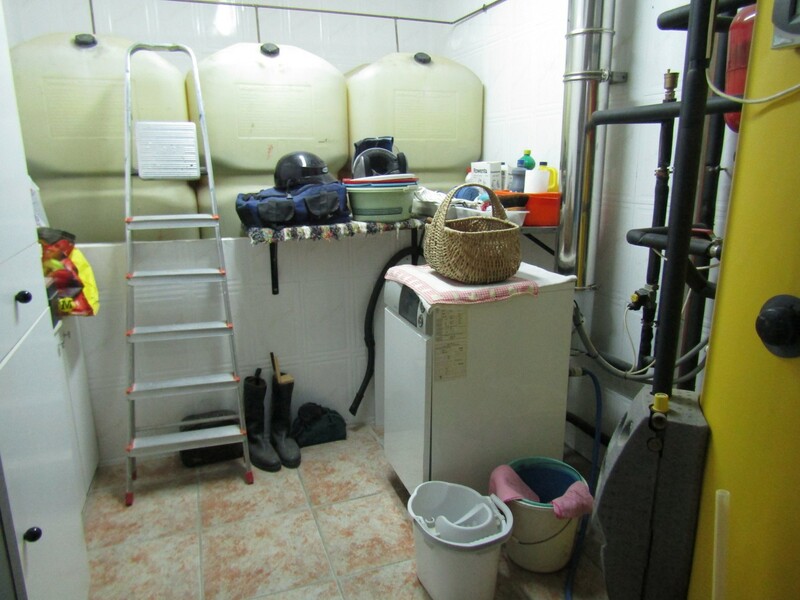 This room houses all the equipment for the central heating and solar system that provides hot water and warmth via radiators to the entire house. 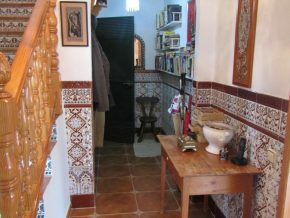 Upon reaching the bottom of the stairs, straight ahead is a bathroom (2.5 x 2m) with shower cubicle; to the right is access (currently via an archway, rather than a door ) to a huge bedroom (6 x 3m) with patio doors leading out to the terrace and pool; and to the left is another archway into two large rooms, separated by a very wide arch. 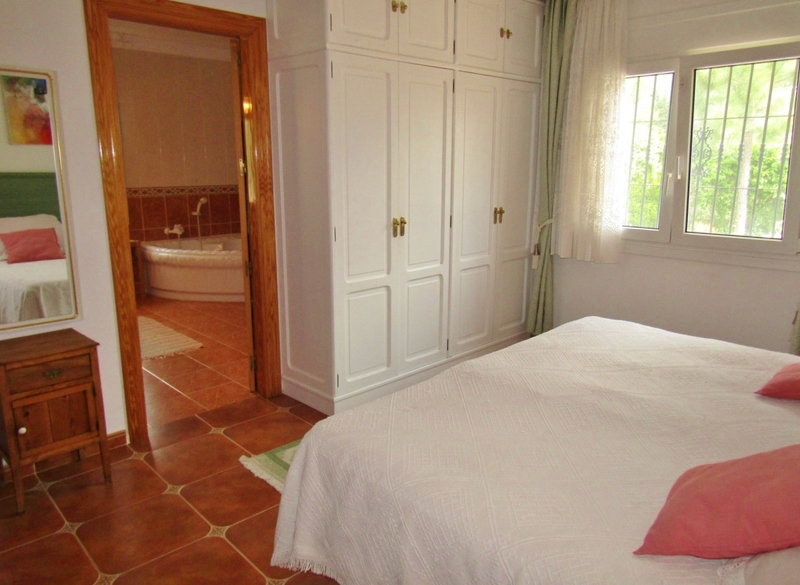 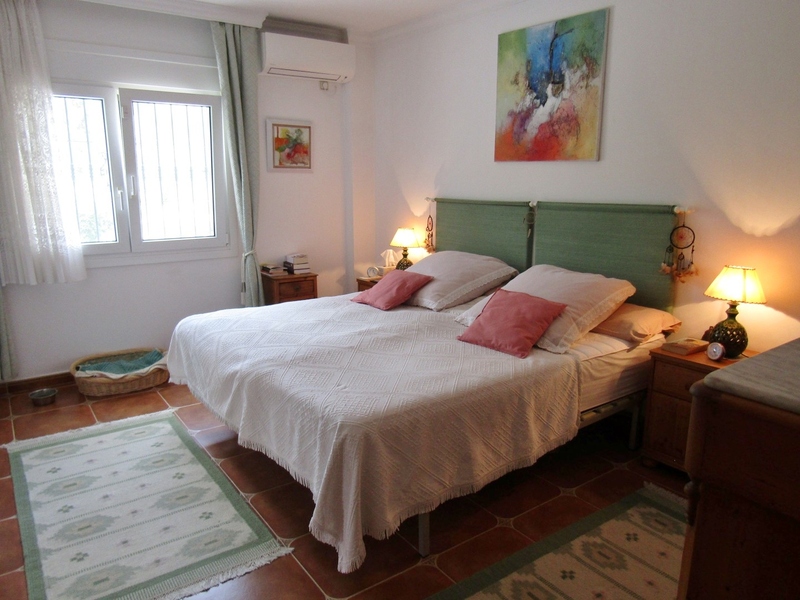 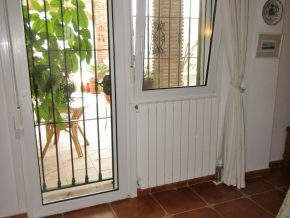 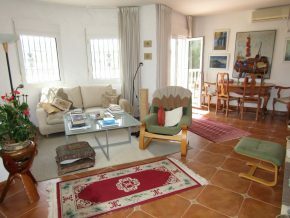 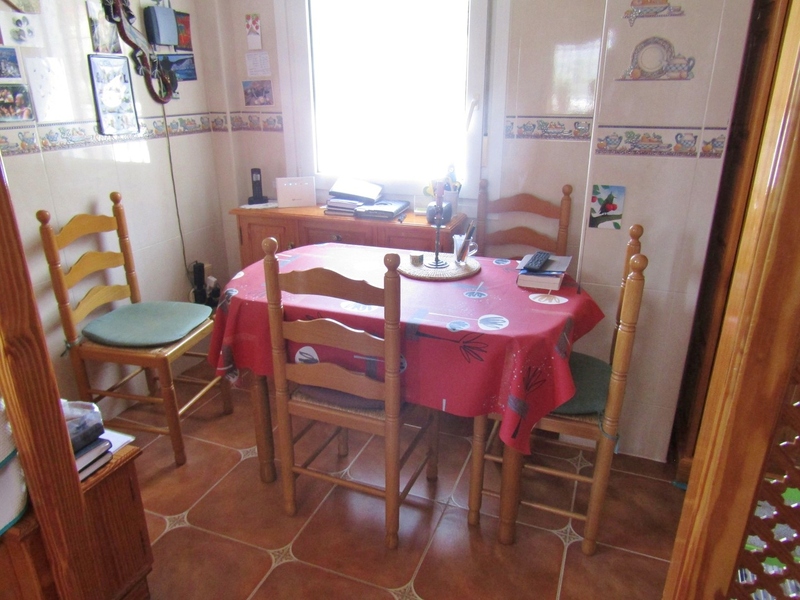 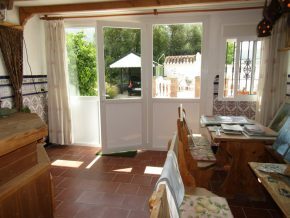 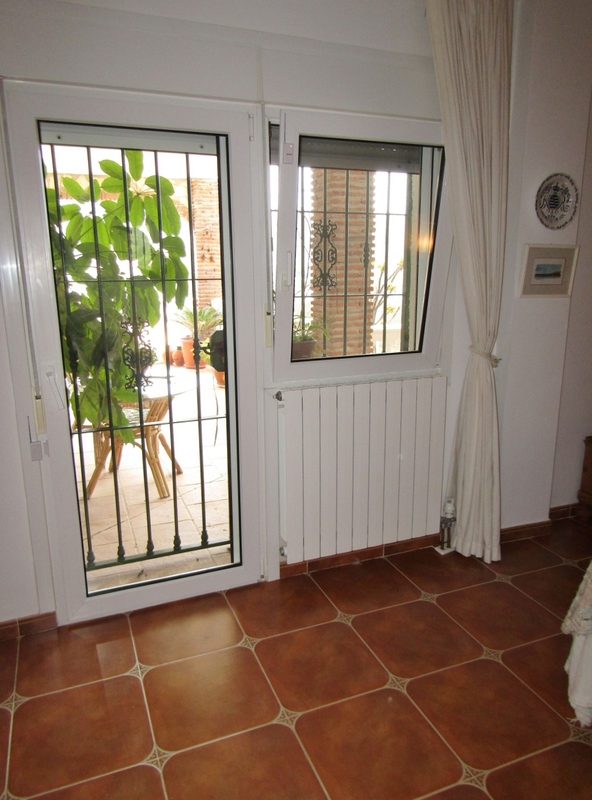 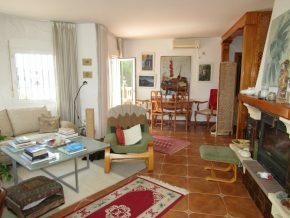 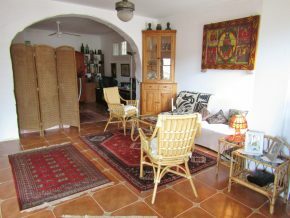 These two rooms are 5 x 3.5m (outer room) with patio doors to the terrace and pool area, and 5 x 3m (inner room) with a high window to the far end. 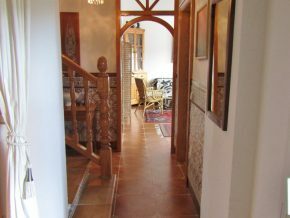 It would be very easy to separate these two rooms by building a partition wall and making a doorway into the fourth bedroom from the hallway. Extra bathrooms can be incorporated as required. 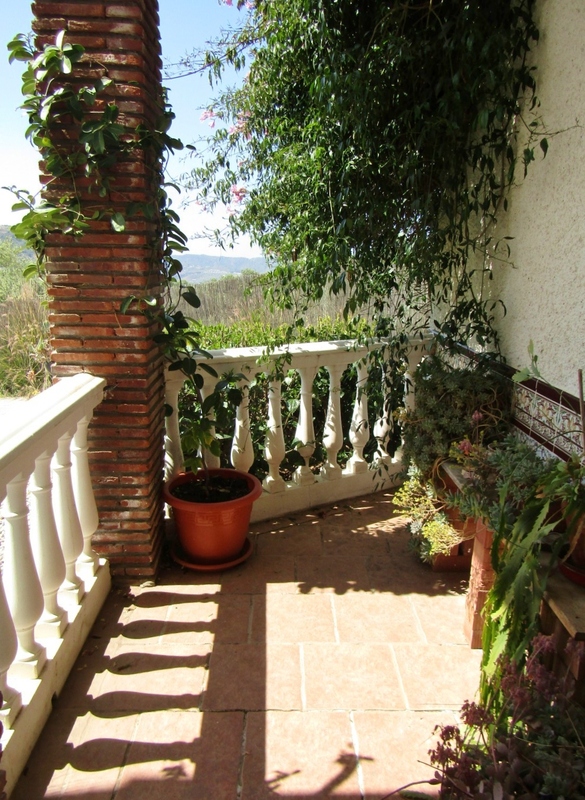 Outside, there are two lovely terraces. 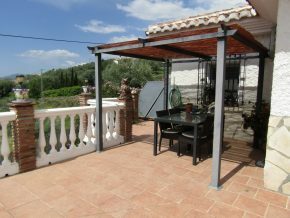 The upper terrace, accessed from the living room, is a huge space with lovely views across the countryside all around and the village, and is in an L shape, with a covered dining area, and a separate area beyond housing the solar panels. 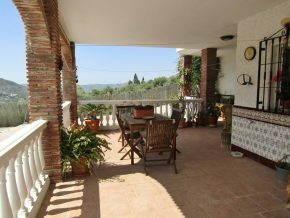 The lower terrace is equally spacious, also with covered dining area. 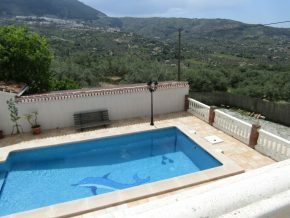 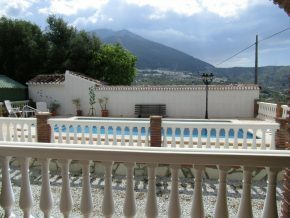 The pool terrace houses the 10 x 5m pool plus steps leading down into the water. Behind the pool, to one side, is the pool room with easy access to all the pool equipment and plenty of storage space. 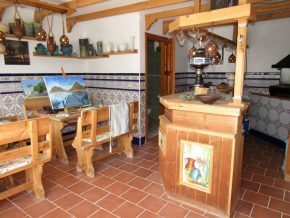 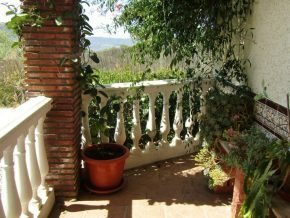 Also accessed via the lower terrace and garden is the studio room, 4 x 3m, currently used as an art studio, which has its own shower room. 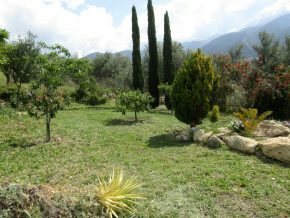 There is also a pretty garden to one side, planted with a multitude of trees and flowering shrubs, making a peaceful and calming garden area to enjoy all year round. 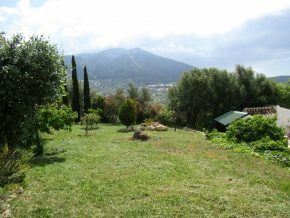 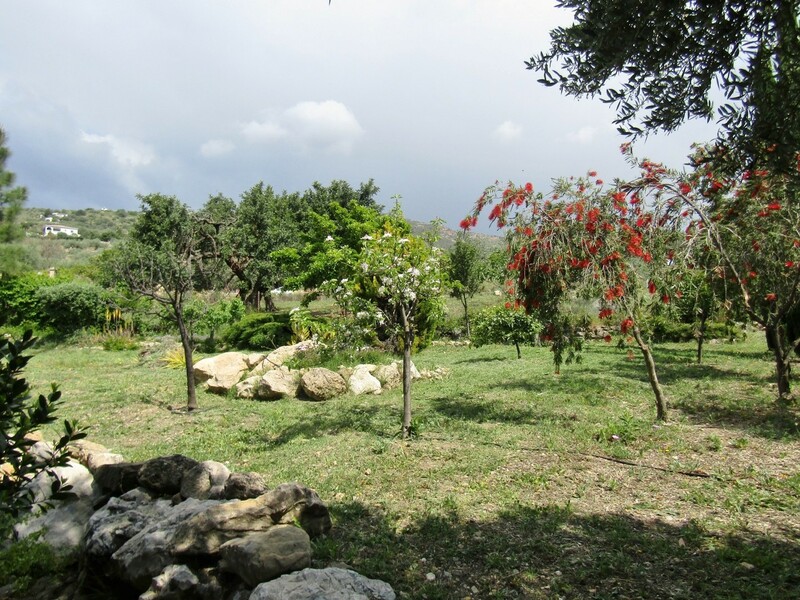 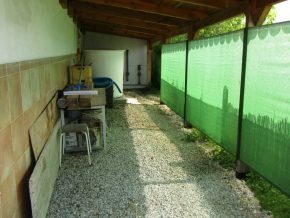 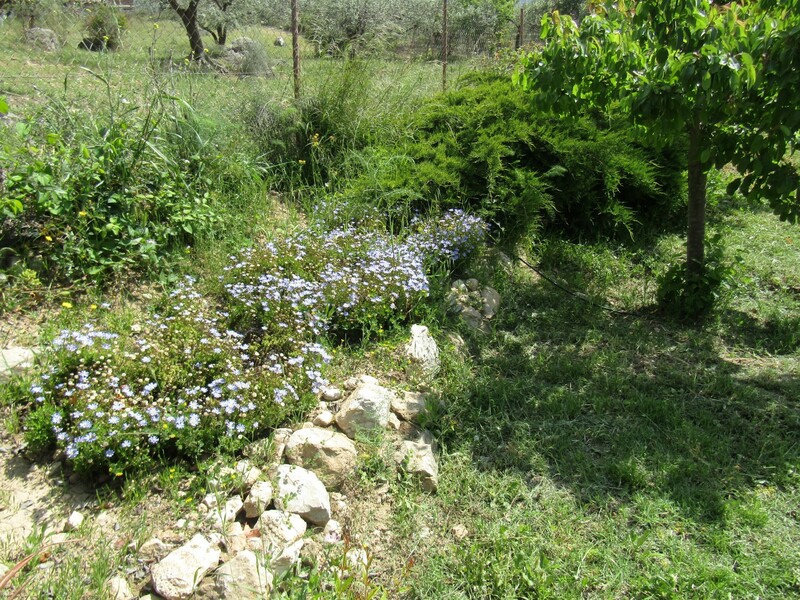 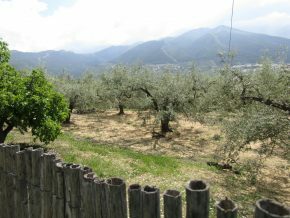 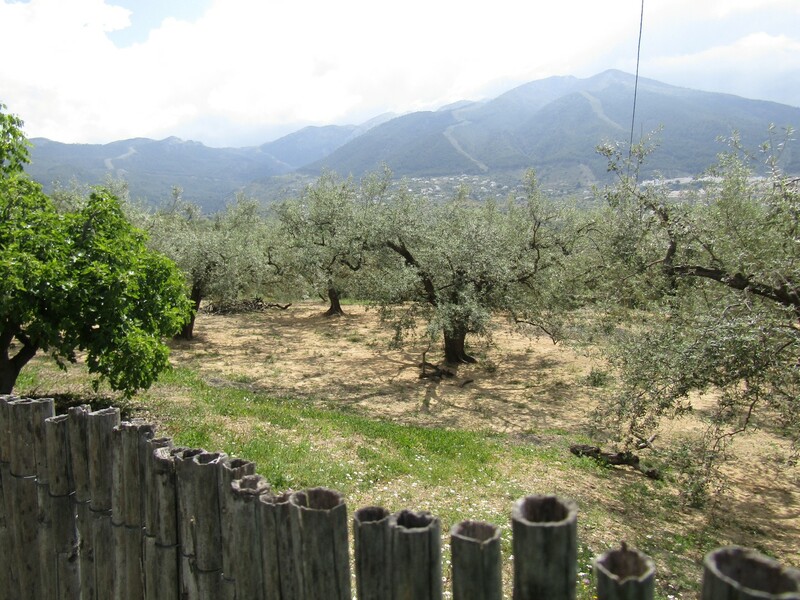 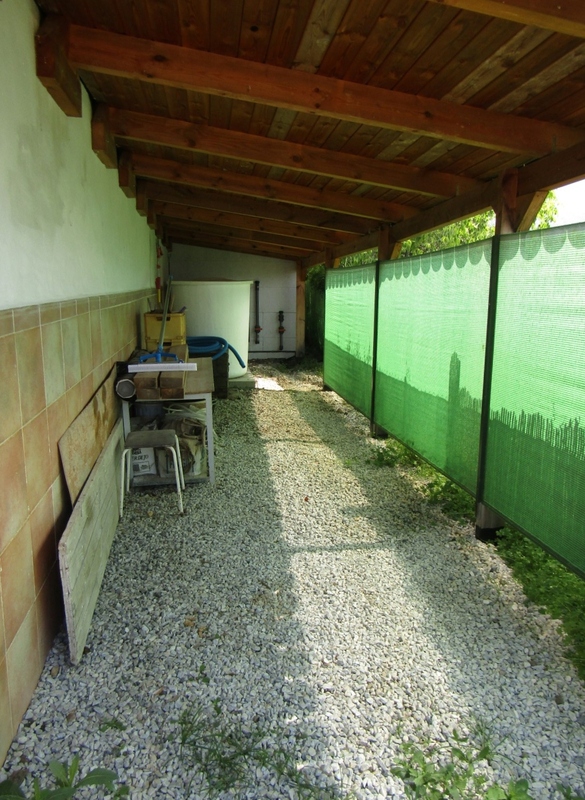 And finally, the rear of the property, behind the pool, and facing the fields of ancient olive groves, is a very useful covered storage area stretching the entire length of the plot. 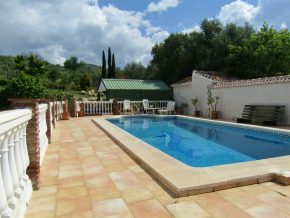 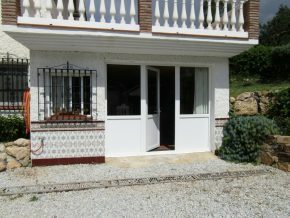 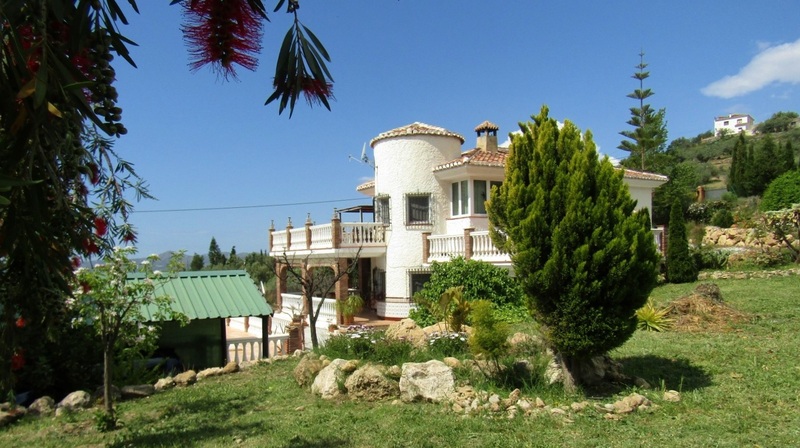 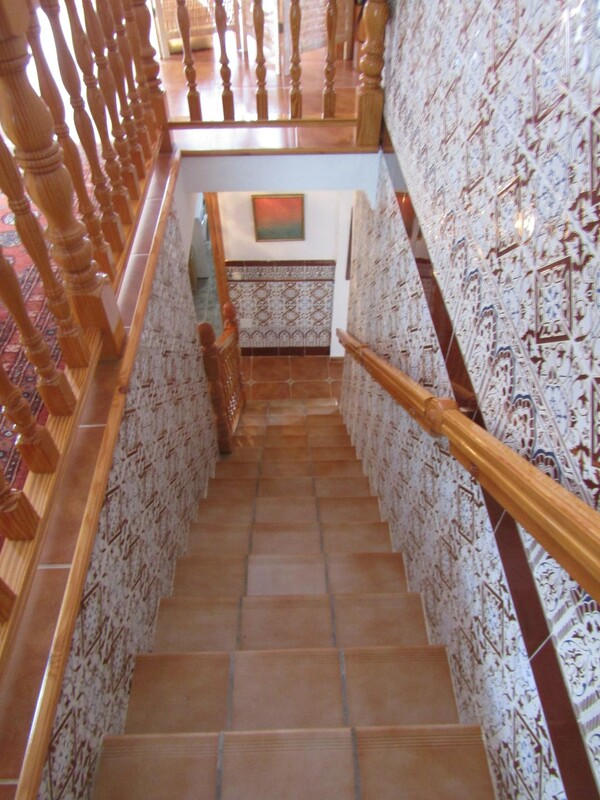 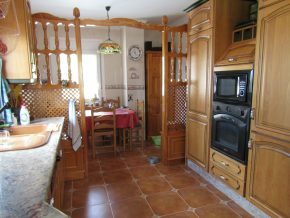 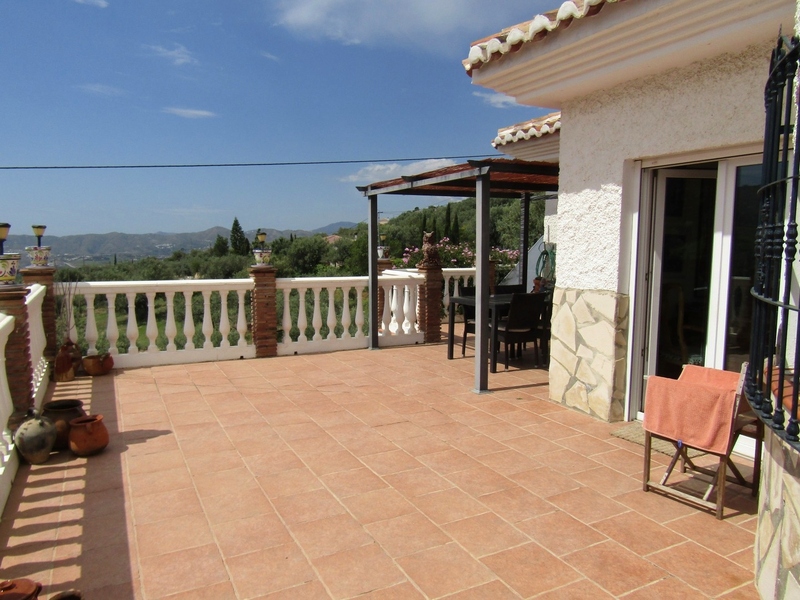 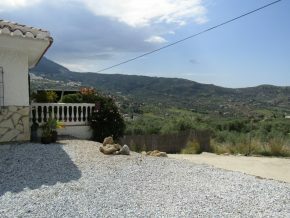 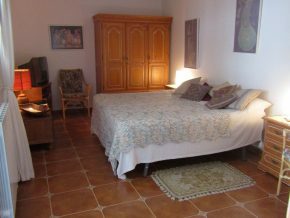 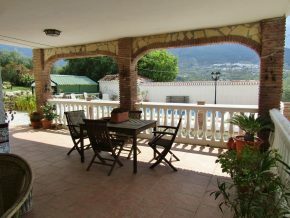 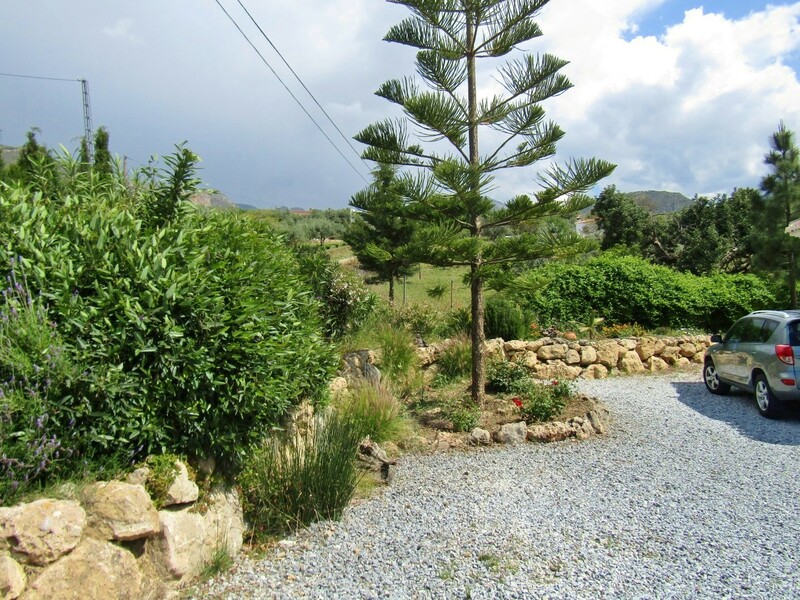 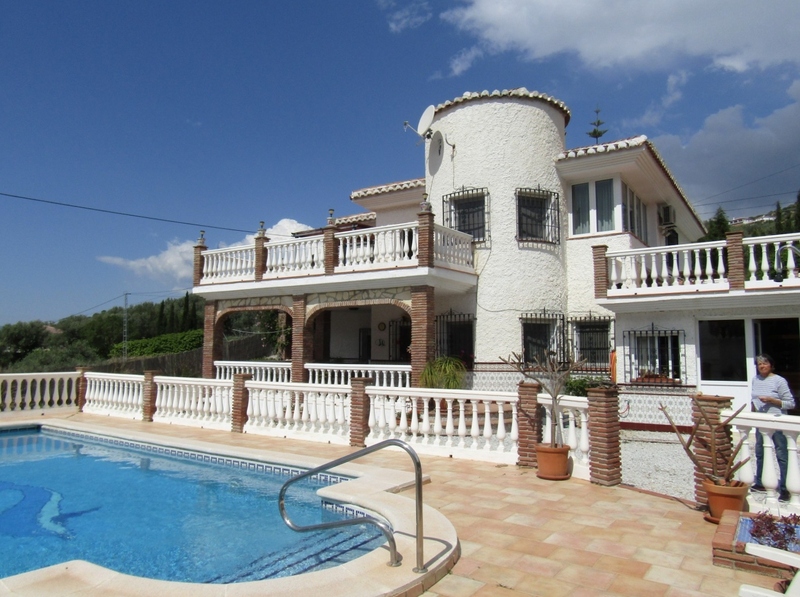 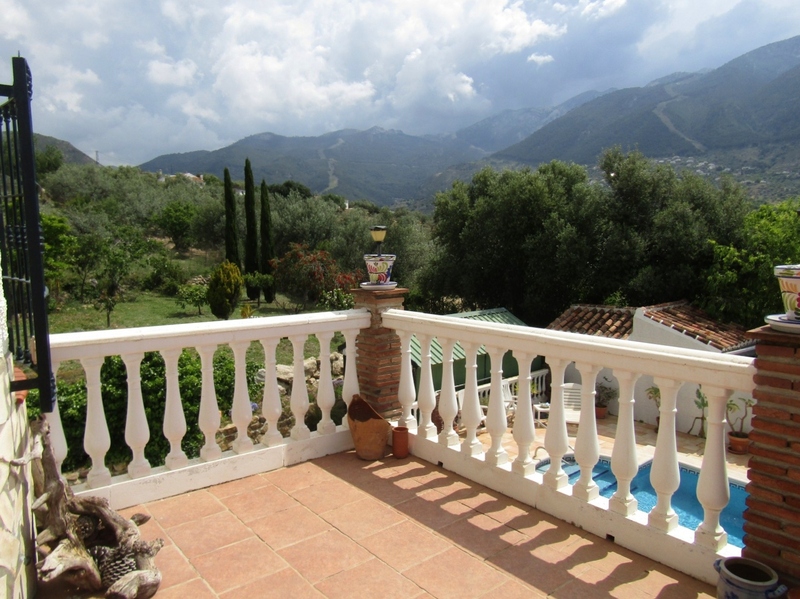 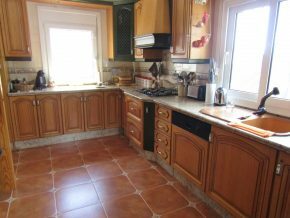 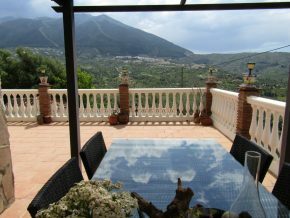 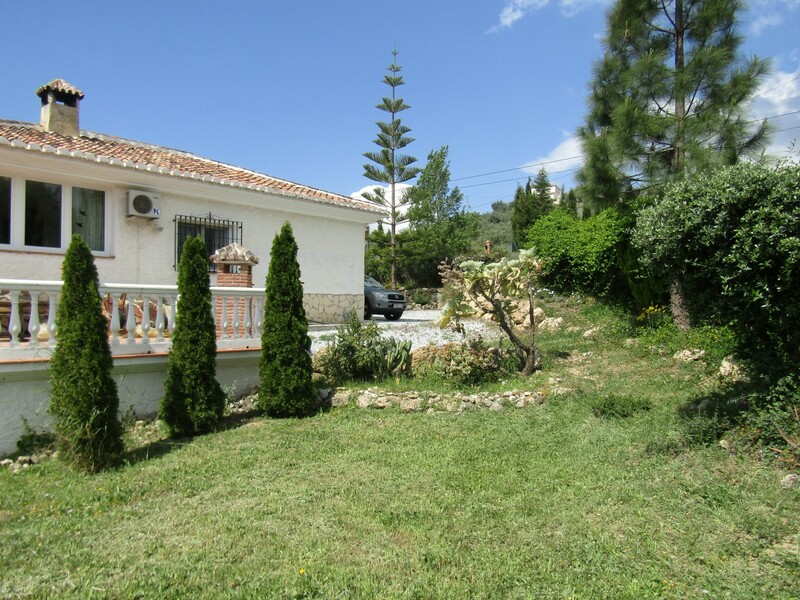 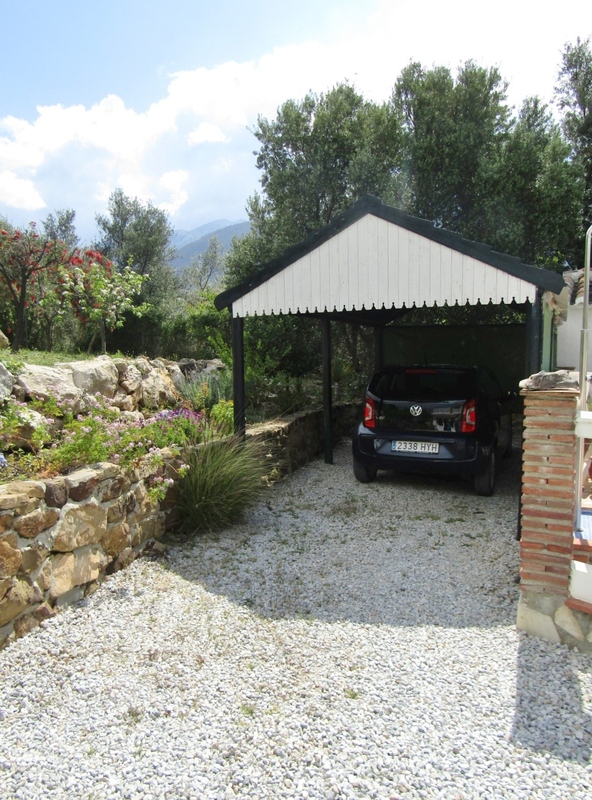 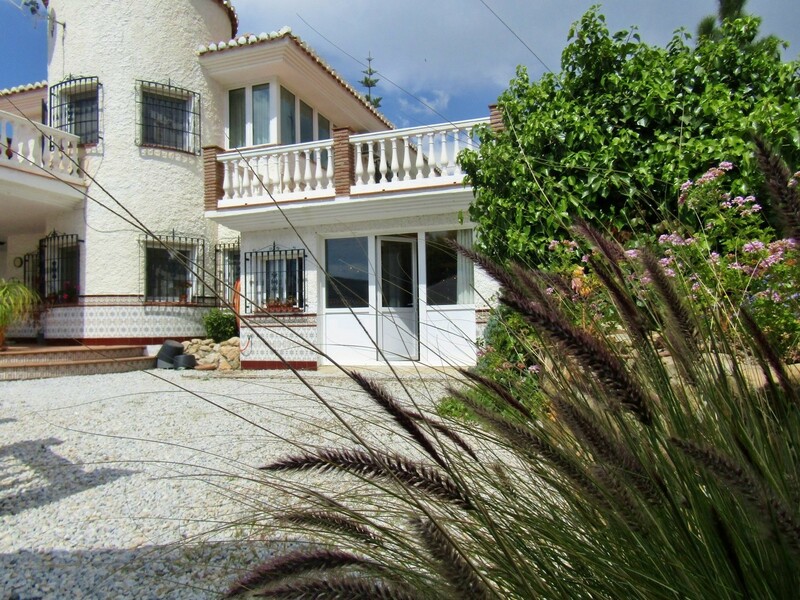 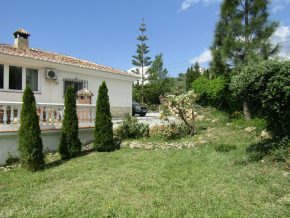 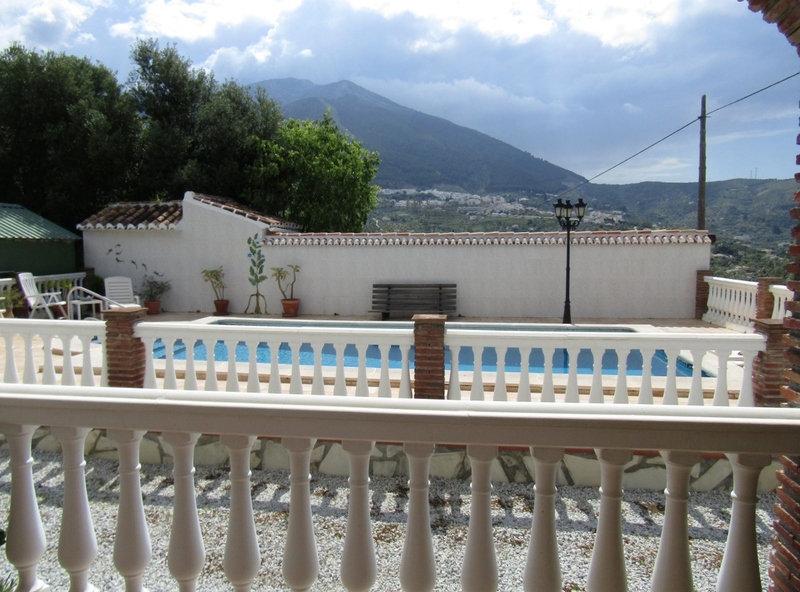 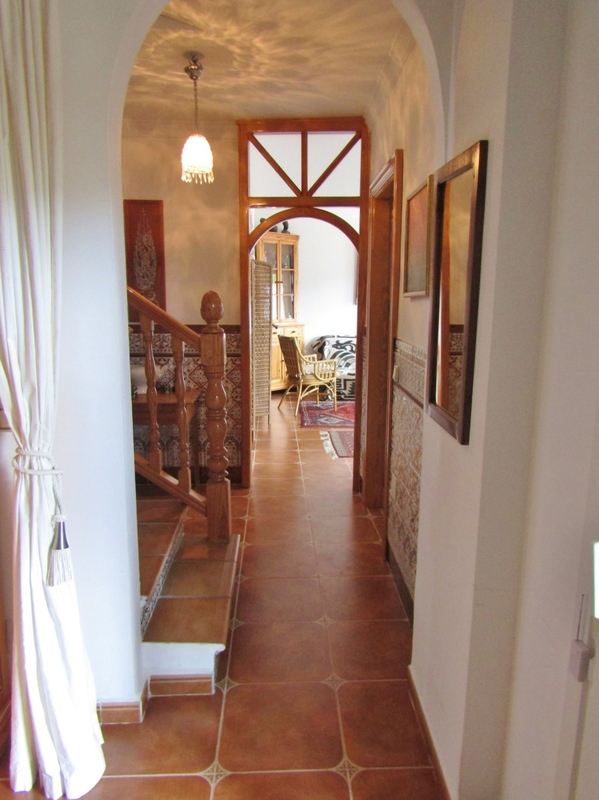 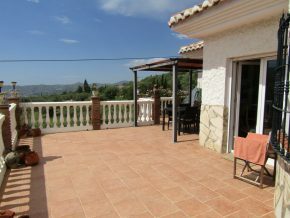 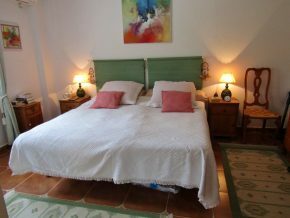 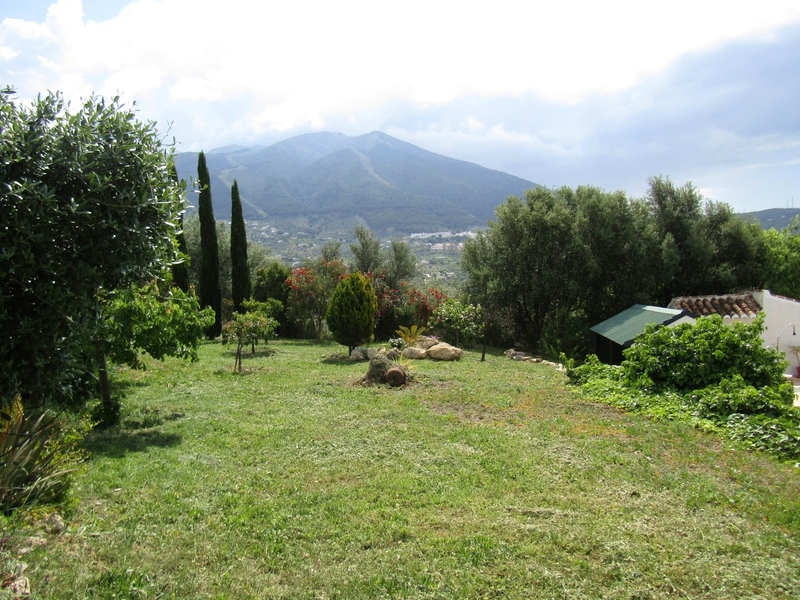 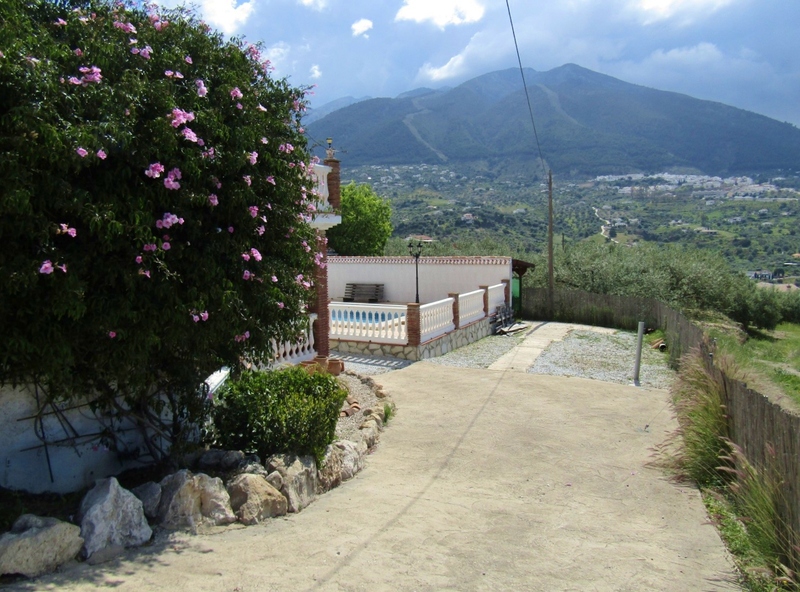 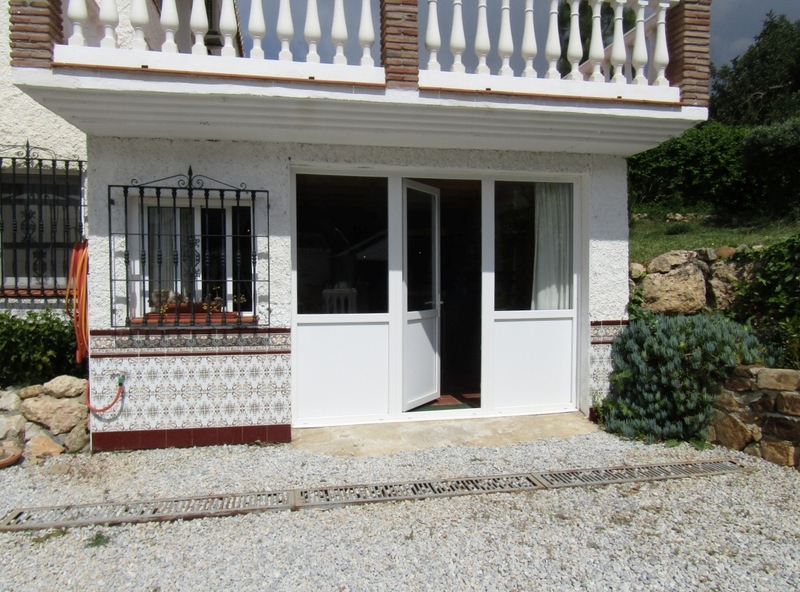 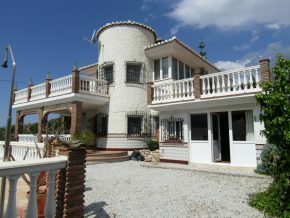 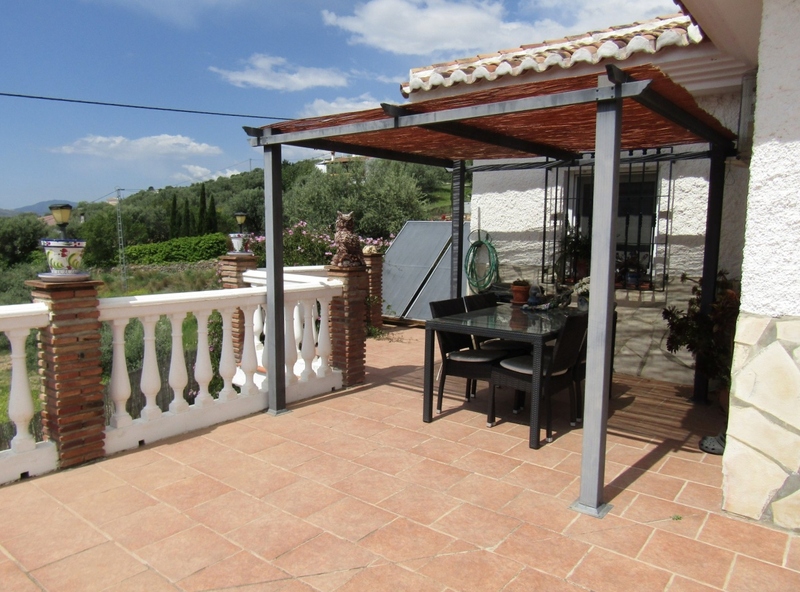 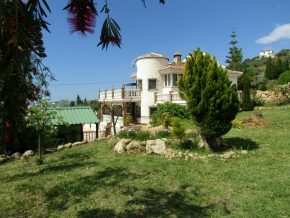 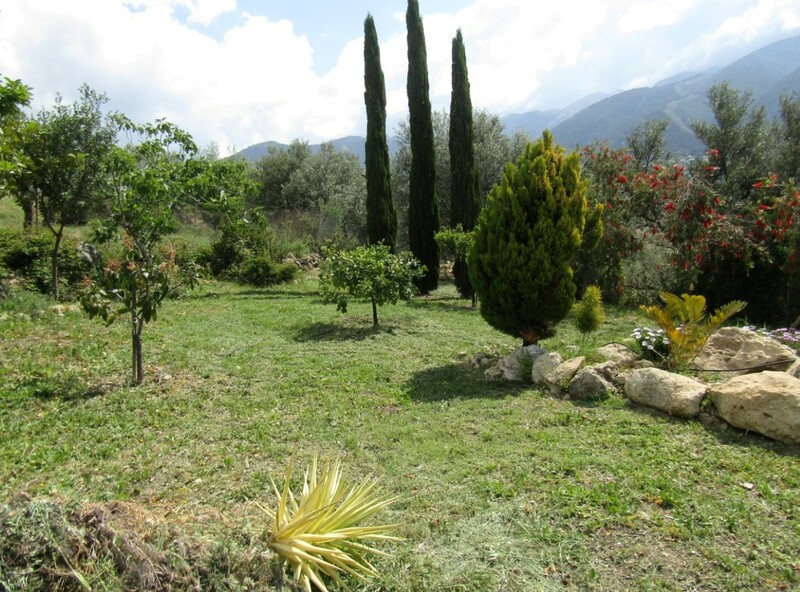 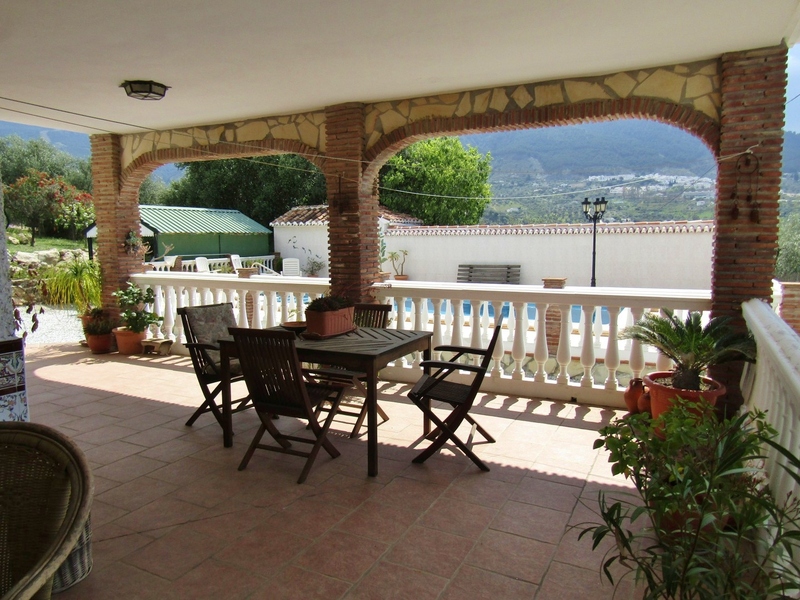 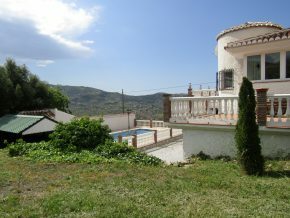 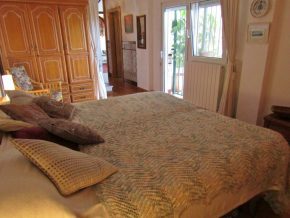 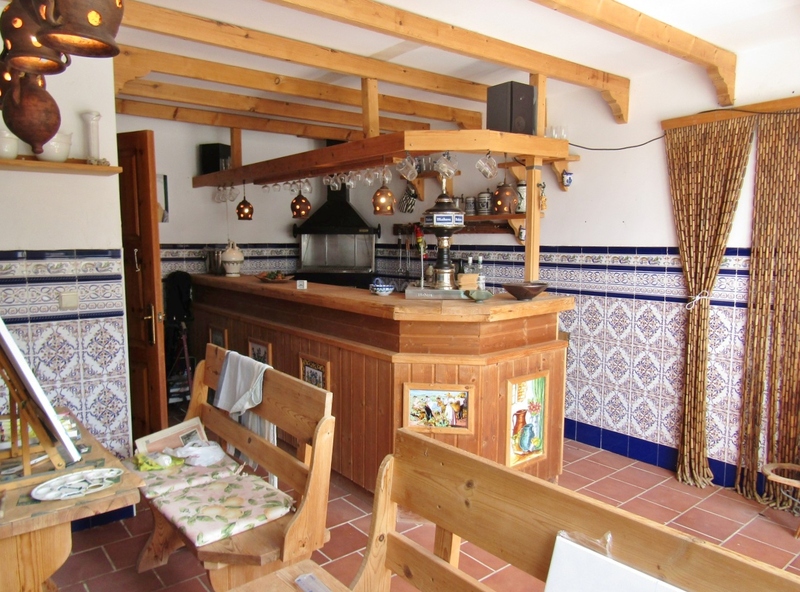 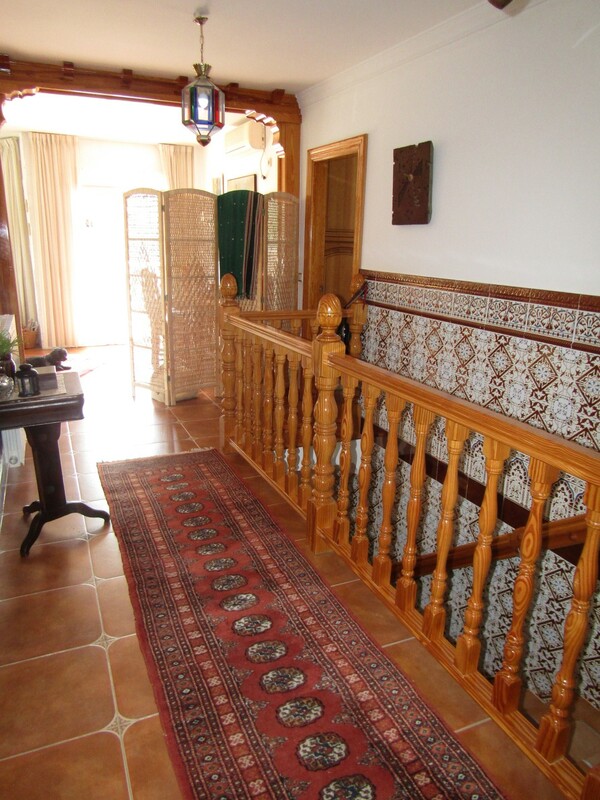 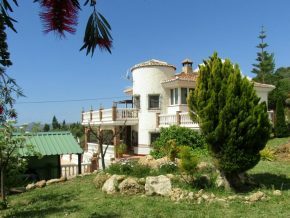 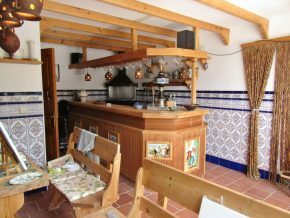 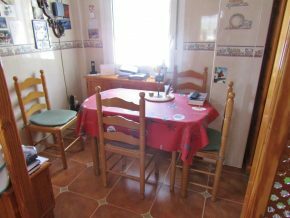 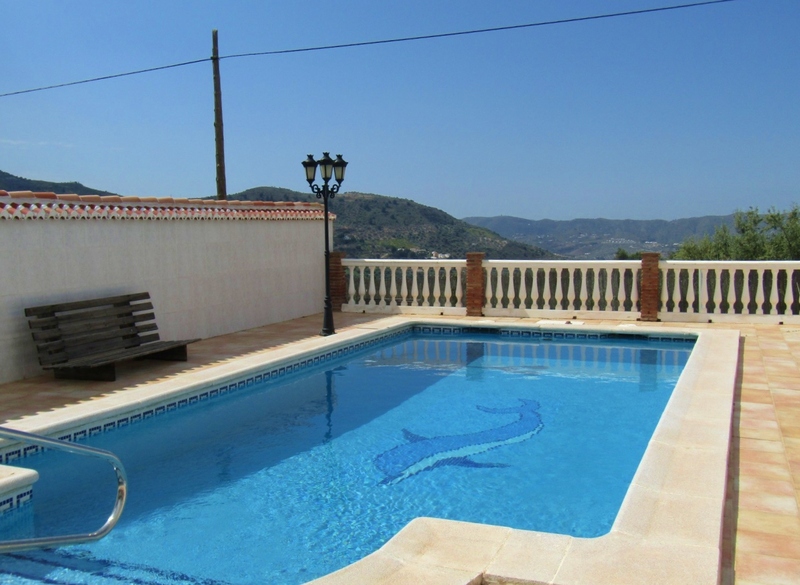 This quality property is the perfect all year round home for anyone wishing to make the move to the beautiful, unspoilt Spanish countryside with all the benefits of a well established, spacious, sturdily constructed, quality family home.